Mullins, PC is a CPA firm dedicated to serving small to medium-sized nonprofit organizations. Mullins PC is singularly focused on the dynamic nonprofit community. We are driven to provide audit and tax preparation services and counsel that help our clients achieve their very important missions. 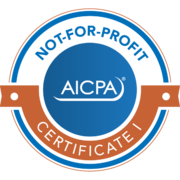 The AICPA has a nonprofit certificate program designed to challenge experienced nonprofit professionals in important practice areas. The Certificate II requires individuals to master complex accounting and financial reporting, tax compliance, governance and assurance matters in a variety of NFP settings. 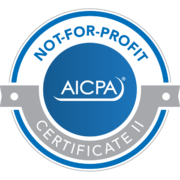 The QuickBooks Pro Advisor certificate demonstrates proficiency with one of the most commonly used accounting systems for nonprofits. John Mullins is the principal of Mullins, PC. Experienced in all aspects of nonprofit auditing and taxation, John founded Mullins PC in order to better serve small and medium-sized nonprofits. Inspired by the meaningful impact his clients have on others, John has chosen to focus his over 15 year career on providing audit and tax services, as well as, support and advice to nonprofit organizations. John’s experience includes audits, reviews, compilations, agreed-upon procedures, internal control assessments, tax return preparation and IRS compliance. His work frequently includes assisting nonprofit boards and leadership grasp the complex financial and tax regulations that affect their organizations. John is dedicated to providing support and advice to his clients beyond typical tax and audit services in order to ensure that nonprofit leaders understand the stories that their financials are telling. Not only does John work extensively with nonprofits professionally, he also volunteers in various capacities with several local organizations. Through this service, John has gained additional insights and perspectives that he applies when serving his clients. Our strength is in partnering with our clients’ leadership, boards and staffs and providing customized, actionable recommendations based on our years of experience in the nonprofit sector. Mullins, PC believes that an audit does not need to be a chaotic and stressful time. Our goal is to perform a rigorous audit, utilize procedures that limit the burden of an audit on client personnel and provide meaning insight and observation to client leadership.